Food waste in the United Kingdom is a matter of serious environmental, economic and social concern that has been attracting widespread attention in recent years. 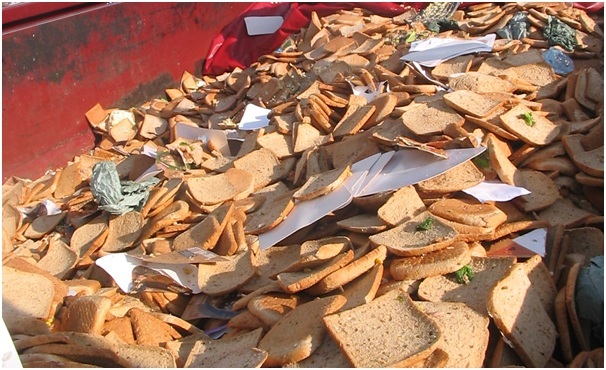 According to ‘Feeding the 5K’ organisation, 13,000 slices of crusts are thrown away every day by a single sandwich factory which is featured in the figure above. More recently, Tesco, one of the largest UK food retailers, has published its sustainability report admitting that the company generated 28,500 tonnes of food waste in the first six months of 2013. TESCO’s report also state that 47% of the bakery produced is wasted. In terms of GHG emissions, DEFRA estimated that food waste is associated with 20 Mt of CO2 equivalent/year, which is equivalent to 3% of the total annual GHG emissions. Globally, 1.2 to 2 billion tonnes (30%-50%) of food produced is thrown away before it reaches a human stomach. Food waste, if conceived as a state, is responsible for 3.3 Bt-CO2 equivalent/year, which would make it the third biggest carbon emitter after China and USA. What makes food waste an even more significant issue is the substantially high demand for food which is estimated to grow 70% by 2050 due to the dramatic increase of population which is expected to reach 9.5 billion by 2075. Therefore, there is an urgent need to address food waste as a globally challenging issue which should be considered and tackled by sustainable initiatives. The overarching consensus to tackle the food waste issue has led to the implementation of various policies. For instance, the European Landfill Directive (1999/31/EC) set targets to reduce organic waste disposed to landfill in 2020 to 35% of that disposed in 1995 (EC 1999). More recently, the European Parliament discussed a proposal to “apply radical measures” to halve food waste by 2025 and to designate the 2014 year as “the European Year Against Food Waste”. In the light of IMechE’s report (2013), the United Nations Environment Programme (UNEP) in cooperation with FAO has launched the Save Food Initiative in an attempt to reduce food waste generated in the global scale. In the UK, WRAP declared a war on food waste by expanding its organic waste programme in 2008 which was primarily designed to “establish the most cost-effective and environmentally sustainable ways of diverting household food waste from landfill that leads to the production of a saleable product”. DEFRA has also identified food waste as a “priority waste stream” in order to achieve better waste management performance. In addition to governmental policies, various voluntary schemes have been introduced by local authorities such as Nottingham Declaration which aims to cut local CO2 emissions 60% by 2050. Engineering has introduced numerous technologies to deal with food waste. Many studies have been carried out to examine the environmental and socio-economic impacts of food waste management options. This article covers the two most preferable options; anaerobic digestion and composting. In-vessel composting (IVC) is a well-established technology which is widely used to treat food waste aerobically and convert it into a valuable fertilizer. IVC is considered a sustainable option because it helps by reducing the amount of food waste landfilled. Hence, complying with the EU regulations, and producing a saleable product avoiding the use of natural resources. IVC is considered an environmentally favourable technology compared with other conventional options (i.e. landfill and incineration). It contributes less than 0.06% to the national greenhouse gas inventories. However, considering its high energy-intensive collection activities, the overall environmental performance is “relatively poor”. Anaerobic Digestion (AD) is a leading technology which has had a rapidly growing market over the last few years. AD is a biologically natural process in which micro-organisms anaerobically break down food waste and producing biogas which can be used for both Combined Heat & Power (CHP) and digestate that can be used as soil fertilizers or conditioners. AD has been considered as the “best option” for food waste treatment. Therefore, governmental and financial support has been given to expand AD in the UK. AD is not only a food waste treatment technology, but also a renewable source of energy. For instance, It is expected that AD would help the UK to meet the target of supplying 15% of its energy from renewable sources by 2020. Furthermore, AD technology has the potential to boost the UK economy by providing 35,000 new jobs if the technology is adopted nationally to process food waste. This economic growth will significantly improve the quality of life among potential beneficiaries and thus all sustainability elements are considered.